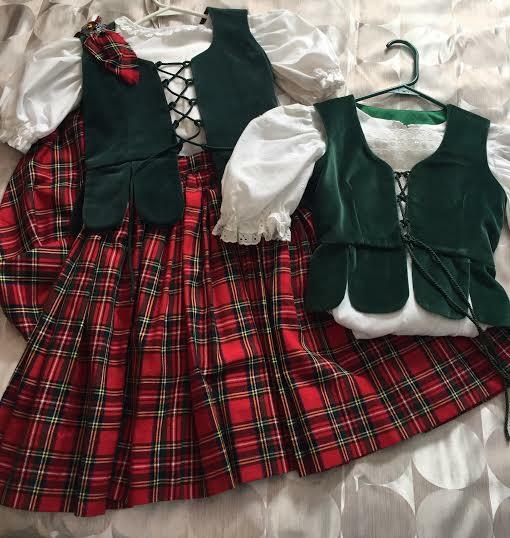 dance.net - Red and green aboyne with 2 vests and shirts (10245376) - Read article: Ballet, Jazz, Modern, Hip Hop, Tap, Irish, Disco, Twirling, Cheer: Photos, Chat, Games, Jobs, Events! Measurements taken while laying flat across the front. Length(from shoulder to waist)- 12"
Asking $400 +shipping from Newfoundland, Canada. Is this outfit still available?? How old was your dancer when she wore this? Gees...i can't really remember. I believe she was maybe 8-10 years old? That's a rough estimate, plus my daughter has always been petite so I'm not sure you can really go by her age.